Purpose of conference is to secure energy resources, provide alternatives to Persian Gulf oil dependency. Israel held its first joint conference between the Defense and Energy industries in Herziliya Thursday. Arutz Sheva had the opportunity to speak to Dr. Gal Luft, Conference Head of Steering Committee and Co-Director of Institute for Analysis of Global Security. "This is the first time in Israel that we are trying to create a meeting of the minds between the Energy Industry and the Defense Industry," Luft stated. "The defense industry is well-established in Israel [and] energy is an emerging issue." "Israel, for the first time in many years, has a role in the global discussion [about] energy security," he continued. "We are trying to be the hub of the discussion." The event, officially the First International Conference in Israel on Energy Defense, and Strategy, was organized in part by several corporations and universities. The main organizer was Israel Defense, a defense and technology company. Participants included the Public School of Policy from Canada's University of Calgary; the Interdisciplinary Center (IDC) in Herziliya; the Israel Institute of Technology (Technion), in Haifa; the Institute for the Analysis of Global Security (IAGS) and the Jewish Institute for National Security Affairs (JINSA). Several government ministries also participated in the conference. The conference discussed security threats to energy supply on the national and global level - including nuclear issues - and also how to make the recent "energy bonanza" more available to consumers. The goal was to utilize Israel's resources in the best way possible. "I think that the Middle East is now undergoing major turmoil in regard to the relationship between the Sunni and Shi'ite communities," Luft continued. The conflicts between the two groups are mushrooming in the Persian Gulf, which has seen over 6,000 dead in Iraq alone since January 2013, and in Syria, which is the site of an ongoing civil war. Both countries harbor some of the world's major oil and gas resources. Luft also corrected misconceptions that the US buys oil from the Persian Gulf; rather, he says, they set oil prices by the standards of the Persian Gulf - making fuel needlessly more expensive. His solution: introducing competitive markets - e.g. natural gas - in the transportation sector. Energy and security often intersect in the Middle East, where resources become a prime factor in political decisions and regional conflicts. Tensions created over the Iran deal between Tehran and P5+1 powers is one obvious example - with Iran insisting that its centrifuges are for nuclear power, not nuclear warheads. Gas prices and oil sales have also been a pivotal talking point throughout negotiations, with opinions varying on sanctions' true effect on Iran's oil market and the ramifications that the deal has on international business to the Islamic Republic. 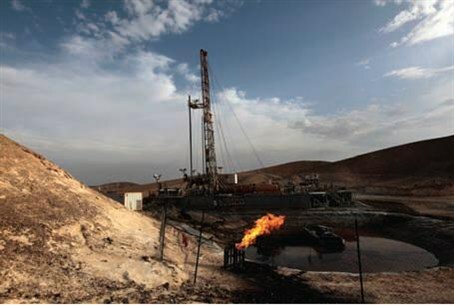 Issues closer to home include Israel's sustaining of Gaza's energy needs. Despite multiple threats against Israel, including genocide, Jerusalem provides Hamas with more than 1/3 of its electricity supply.